In this guide, we review the best portable massage tables the market has to offer. Further, in the review, we will take you through a couple of things you need to consider in order to make a selection that is ideal for your situation. This comprehensive review, you will be able to make a well-informed decision that is in line with your needs. 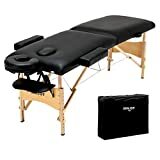 This massage table from Best Massage ensures that both the masseuse and the client have an easy time for the best results. The upholstery feels soft and is both water and oil resistant, and the high-density sponge gives the clients a very comfortable experience. The frame and legs are made of reinforced hardwood. This makes it strong while maintaining a perfect level of weight for portability. At a weight of about 39 pounds, this massage table can be carried around with ease. This is further facilitated by the handle on the unit. It is easy to set up and fold down. It takes up very minimal space making it best suited for constrained spaces. The backrest on this massage table is adjustable up to a certain angle. This is very handy for facials, or when your client is expectant. The masseuse can easily adjust the height from 24 to 34 inches. The carrying bag has no shoulder straps, although if you aren’t that tall, the hand straps are long enough to go over the shoulder. The material used to make it is light and flimsy. This makes it only suitable for such people as students, who only need to carry it once or twice. If you make many home visits, you will have to invest in a new bag. 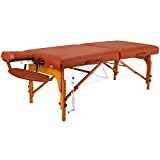 The Blissun 84″ Portable Massage Table feels sturdy and well built, giving the notion of a durable product. Its entire frame is made of beech wood for a nice trade-off of weight and strength. It very well achieves this, as it comes weighing a mere 30 pounds, and is capable of holding clients of up to 661 pounds. Its padding is 2.5 inches thick and made from high-density foam to ensure maximum comfort even after extended periods of time. It is covered with quality PU leather to give it its water and oil resistant qualities. This PU leather is soft and easy to clean as it rarely builds up any dirt. 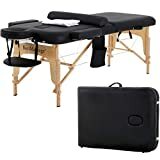 Blissun 84″ portable massage table comes with a couple of detachable accessories that include a headrest, a swivel face cradle, winged armrests, and a carrying bag. The carrying bag is made of nylon so it doesn’t get dirty first. It makes carrying the unit around pretty easy, as it has a shoulder strap. Your hands will be free to do other things when you are carrying it around. This massage table takes a different road from the above, by making use of aluminum for its frame and legs. The pull cord of the massage table is so strong that it can be used as a drawstring to a car. This gives a sense of durability and security. Each leg has a mechanism to adjust the height to match different height requirements. The adjustment mechanism is simple and intuitive. You won’t need any help. When you open the lock and pull it open, the legs automatically fall into place. This simple set up will have your massage in progress less than 5 minutes after you open the packaging. The sponge that makes up its upholstery is dense and soft for comfort over long periods. The table is pretty wide, measuring 27.5 inches so it can accommodate a wide range of clients. You can adjust the face cradle up and down to find the best angle, after which you can lock it into place. Despite the attention to detail on this one, it weighs a mere 36 pounds so it shouldn’t be that hard to move around. Uenjoy Massage Table is made of very high-quality materials. The frame and legs are made of reinforced hardwood which makes it very strong and sturdy. It can hold up to 500 pounds so it can be used by everybody. It has a width of 23.6 inches which can be said to be medium. However, the high-density foam that is covered by the oil and water resistant leather pad covering measures just 1.57 inches. Most portable massage tables come with at least 2.5 inches, so this may not be the most comfortable – especially if you were used to other models. It may get uncomfortable after extended periods of time. Uenjoy massage table comes with a number of easily detachable amenities such as a headrest, armrest, face cradle, and arm sling. On top of that, it comes with a carrying bag to pack in while transporting. This bag has a shoulder strap for convenience. As the table falls on the heavier side of things, its portability is somewhat reduced. The height is adjustable from 22 to 33 inches. If there was a reward for best looking portable massage table, then Merax would win by a landslide. The top is covered by a soft PU synthetic leather that is black at the middle and red at its edges, making it look classy. The PU synthetic leather covers a 2-inch high-density foam. The frame and legs are made of aluminum for the perfect blend of weight and strength. The frame can be adjusted through a height of 26 to 36 inches. The adjustable backrests allow the masseuse to prop clients into a seated position for facials, leg and arm treatments among others. The removable armrests increase comfort for the client. It weighs 37 pounds and has a capacity of 500 pounds. It has a width of 23 inches, which may be too narrow even for a small frame client. With a two-inch padding, if you or the clients that you are dealing with weigh over 300 pounds, this table may not be too comfortable. If you are to use it professionally, you should consider these two shortcomings. It is sturdy, however, and won’t wobble even under immense pressure. 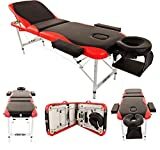 If you want to do stretching exercises, and it is hard for you to get down and back up from the floor, the SierraComfort Basic Portable Massage Table is definitely the one for you. It is more than just a massage table – it excels when used for exercise. In fact, several users have reported that they bought it specifically for exercise. There are many reasons why it is that popular among home users. To begin with, the width of 28 inches is more than sufficient to cater for people of almost all sizes. The padding is 2.5 inches thick and conforms to the shape of the body, making it among the most comfortable in this list. It is easy to fold and store away when not in use and takes up very minimal space. The weight of 36 pounds, coupled with the carrying handle simplifies moving around. The frame and legs are made of beech hardwood for durability. You can adjust it from 23 to 33 inches and can hold a maximum weight of 450 pounds. 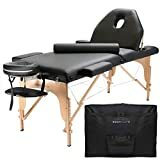 Saloniture Professional Portable Massage Table is perfect for entry level as well as well-versed masseuses. The manufacturer placed great attention to detail when designing it, giving it a professional and premium look. The frame and legs are made out of hardwood, and the support cables out of strong steel. This, plus the two tension knobs on each leg make it very stable and won’t wobble however heavy the client might be. It can hold up to 450 pounds. You can fold and unfold it easily. The legs have non-slip feet to prevent it from sliding when placed on slippery floors. It also protects your, or your client’s, floor from scratches and dents. The top is made of a 2.5-inch foam cushion making it very comfortable even after laying on it for extended durations. This foam cushion is covered by a quality PU leather that is soft, oil and water resistant, and has no odor even when new. Saloniture Professional Massage Table weighs a little over 30 pounds. Coupling this with its nylon carry bag, you can bring it with you very easily. The carry bag has a convenient side pocket that is large enough for a couple of massage tools. The attachments that come with the table can be stored within the table itself when it is folded down. Padding is where this massage table excels. Almost all users commend it for its padding, which feels comfortable even after extended use. It makes use of a high-density foam that is covered by a PU leather coat for softness and oil and water resistance. The foam measures 2.5 inches in width and conforms to the shape of the body increasing overall comfort. The table has a width of 28 inches, placing it among the widest in this guide. This width makes it ideal for people of all sizes on top of increasing its stability. The frame and legs are made or reinforced hardwood which is known for its strength. Each leg has knobs to adjust the height to match different client-masseuse needs. You can adjust the height from 24 to 34 inches. 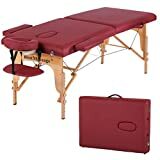 This two-fold massage table weighs 36 pounds and comes with a carrying bag with a shoulder strap. With that, you can carry it with you easily. On reaching your destination, you will find that it is easy to set up and take down, with the accessories attaching and detaching fast. As far as aesthetics and comfort are concerned, this professional portable massage table by Saloniture doesn’t disappoint at the very least. It is made of a comfortable 2-inch foam that is covered by a high-quality synthetic leather that is oil and water resistant. This padding is sturdy enough to hold heavy clients, but not so much that it can get uncomfortable. You have three color options from which to choose from namely: namely black, cream and maroon. This allows you to match, or compliment your internal decor or mood. The frames are all made of hardwood for stability, which is furthered by the strong steel support cables. This sturdy construction allows it to hold up to 450 pounds. The legs have non-slip feet, to prevent it from moving around as you exercise or massage someone on it. It is easy to set up and take down and weighs 37 pounds. Although not as light as some of the options in this review, it is still simple to carry thanks to the double carrying handles. It snugly fits the carrying bag with adjustable shoulder strap for transport. The detachable accessories that come with the unit can be tucked away from sight inside the table when it is folded down. 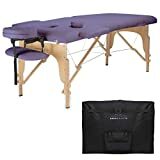 This BestMassage PU Portable Massage Table is designed to maintain its lustre for a very long time after purchase. It will look new even after years of use. It makes use of a strong birch construction to increase stability. As a professional masseuse, you will find yourself constantly opening and folding it away as much as three times a day. The strong birch construction ensures it can withstand this frequent open-closing without weakening. What really sets this massage table apart from the rest is its detachable cushions. With these, you can fold it down to a very compact size, doing away with the cumbersomeness common in other portable massage tables. These cushions are two inches thick. Even with consistent frequent use, they cannot loose their shape or flatten. They are covered by PU leather, making them oil and water resistant for simple cleaning after a session. If you are one to take care of the environment, then you should try products from Earthlite, such as the Harmony DX. Earthlite is a very responsible company that is set on producing products without harming the environment at the very least. Each of their product is eco-friendly. The Harmony DX, instead of going the conventional beech wood way, makes use of maple wood that is ethically sourced. This maple comes from managed forests, observing all the environmental friendly laws. It is treated with environmental-friendly glues and water-based lacquer. The surface has a width of 30 inches, making it the second-widest table in this guide. It has a thickness of 2.5 inches so you can lay on it for long durations without discomfort. Instead of PU leather seen in most other models, Harmony DX uses a fabric made by “Nature’s Touch”. it is not only as comfortable as leather, but also just as long-lasting. One would expect the Harmony DX to pale in comparison to other portable massage table seeing as it only makes use of environmentally friendly components. On the contrary, it is stronger, more comfortable and durable than most. This is evidenced in the company’s warranty policy, which covers three years for the upholstery and foam, and is life for construction and frame. Harmony DX can hold up to 600 pounds. 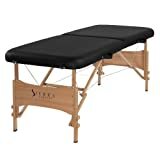 Sierra Comfort All-Inclusive Portable Massage Table is a perfect choice for professionals for home visits. It is quite versatile and comes with a number of accessories such as a removable headrest, cotton sheets, bolster, towel hanger, and oil pouch. When folded down, it provides a convenient way to store the accessories, eliminating the need for extra luggage. The frame and legs are constructed from high-grade beech and the surface has a comfortable 2.5-inch cushion. It has a width of 28 inches, which is just perfect for most client needs. For added comfort, it has a removable and adjustable face cradle. It also features armrests and arms supports. The legs of the table can be adjusted in height to meet different masseuse needs. They have non-slip feet to prevent unnecessarily moving around or scratching the floor. The folding mechanism uses three hinges for a fast and seamless operation. It folds down to a compact size and snugly fits inside the nylon carry bag. Even though it falls on the heavier side of things (40 pounds), the carry bag has a pair hand strap and one shoulder strap to evenly distribute the weight across your back and arms. This table saves you the extra money you would have to spend on a heating pad. It comes with a patented Therma-top to provide therapeutic warmth for a more pleasing experience. It provides adaptable warmth in up to ten settings over the entire stretch of the table for increased circulation and improving vitality, dong away with tension and fatigue. Instead of the conventional piano wire, this massage table makes use of a patented due-plane hinge that exerts less pressure on the wood. The result is increased strength and capacity, as it is capable of holding up to 1500 pounds, far much than most of the above options combined. The innovative face cradle is also patented and is ergonomically designed to snugly fit all face shapes. This is made possible by the curved crossbar. Instead of regular panels that are less sturdy, this table features reiki panels on both sides. They allow the masseuse to move closer to the client for better angles by allowing them to stretch their legs under the table. The leather coating is water and oil proof and is covered by a five-year warranty to guarantee it. As promised, here are a couple of the main features that you should check for to get one that matches your situation. Small massage tables may be restrictive on the number and size of clients you can serve. On the other side, a large massage table will mean more weight and reduced portability. 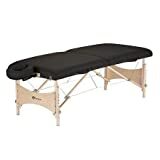 It is advisable to go for a standard 2-fold massage table but you should gauge the trade-off between sizes and by matching them to your intended needs, you will make a good decision. Most of the latest models tend to put the height adjustability as a standard. The model that you go for should be easy to adjust and not need any additional help nor take up much of your time. There are two aspects of weight to consider. The weight of the table itself, and the weight capacity. Since you never know when you may need to move your table, it is advisable to go for a lightweight option that is sturdy enough to support a lot of weight. This guide has got you covered on that front, as it contains tables with capacities that range from 300 to 1500 pounds. If you go for a heavy one as they generally tend to be more functional, it is advisable to go for one with a comfortable carrying bag. The two most common materials used to make portable massage tables are aluminum and wood. Wood is much more recommendable as it is lighter and tends to be stronger than aluminum. Aluminum is generally more durable and provides a faster fold-unfold mechanism. The thickness of the foam determines how comfortable you or your clients will feel. There some that go above three inches, but the standard is 2.5 inches. Some units also come with detachable upholstery for added convenience. These are quite a gem. The upholstery of most models is made of leather for simplicity in cleaning and visual appeal. If you are eco-friendly, however, you can try out the Earthlite which uses a fabric called “nature’s touch”. The above options represent the best value for your money. At this point in time, it is safe to say you are equipped with all the relevant information you need. All that is standing between you and a perfect massage session is making a selection from the above options.